The Konbaung Dynasty was founded in 1752 by Alaungpaya who by successful conquest and skillful diplomacy united upper and lower Burma. When his heir, Bodawpaya, ascended the throne in 1782, he moved the royal capitol from Ava to Amarapura, a distance of about five miles. His grandson and successor, Bagyidaw, shifted the capitol back to Ava in 1823. Tharawaddy (1837-46) who succeeded Bagyidaw took the capitol back to Amarapura and it remained the seat of the Burmese kings until Mindon established the new capitol at Mandalay in 1853. Amarapura was laid out in the perfect form of a square mandala with brick walls and a moat encircling the city. A grid of streets can be traced within the walls. Each of the twelve city gates, three along each wall, were surmounted by a Burmese-style wooden pavilion known as a payatthat. Like many Burmese capitols, little remains of the splendors of Amarapura. The palace buildings were dismantled for re-erection in Mandalay and most of the bricks in the city walls and masonry buildings were removed to construct roads and railway tracks. Only two masonry structures still stand within the city, the Treasury and the Records office. Major stupas were built at each corner of the city. The Patodawgyi Stupa, built outside the city wall in 1816, is one of a number of Konbaung stupas to be modeled on the Shwezigon at Pagan. Although it continued the Pagan tradition of depicting the Jataka stories on the lower terraces, in this case, the Jatakas have been sculpted on small marble slabs instead of being fashioned of clay or sandstone. 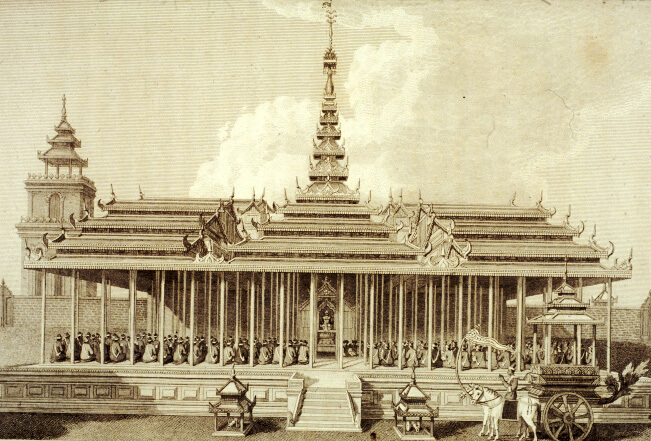 King Pagan built the Kyauktawgyi Temple near Taugthaman Lake in 1847 as a replica of the Ananda temple at Pagan. The exterior form approximates that of the Ananda whereas the interior is dramatically different. Wooden rafters and beams replaced the extensive use of brick vaults and arches. Although the Greek cross ground plan was retained, the interior is generally open without the two circumambulatoy corridors connecting the four inner shrines. Instead of four colossal standing images of the Buddha, there is a single, seated Buddha image in bhumisparsa mudra that was carved from a huge block of Sagyin marble. There are four entrance halls, two of which are adorned with wall paintings that use novel, often "western", pictorial devices to represent religious and secular buildings in a continuous landscape. The Nagayon Temple, built within the city of Amarapura, has the exterior form of a dragon or naga. This is the Naga Muchalinda who protected the Buddha while he was meditating and is usually depicted immediately behind and above an image of the meditating Buddha. In this case, an enormous Naga looms protectively above the entire temple building that within shelters an image of the Buddha. 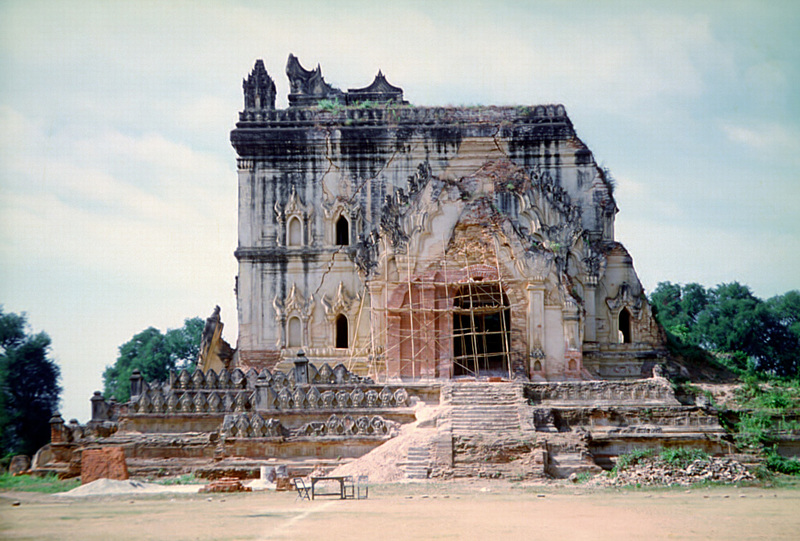 The most remarkable structure to be built during the Konbaung period was certainly the temple at Mingun, located across the river and approximately ten miles north of Amarapura. When King Bodawpaya began construction in 1790, he intended it to be the tallest Buddhist monument in the world and to reach 500 feet in height. It was to have an enormous shikhara tower modeled on the temples at Pagan. Construction by a vast force of conscripted laborers continued for twenty years before the project was abandoned upon the king’s death in 1819 when only the base had been completed. An attractive series of terracotta plaques with new themes were produced for insertion in the niches on the exterior of the temple but installation was never carried out. A colossal pair of guardian lions were constructed in brick and stucco at the river landing which served as the main entry to the temple. Bowdawpaya had the largest bell in the world cast as an intended fixture of the temple. It weighs 90 tons and still rings from its pavilion near the temple base. King Bagyidaw built the Hsinbyume Stupa just north of the Mingun temple in 1816. Its novel form mimics the mythical Sulamani stupa where the Buddha’s shorn locks were enshrined after he shaved his head to become a monk. The Sulamani Stupa is located in Tavatimsa Heaven atop Mt. Meru and is accessed by a tripartite, jeweled staircase. The Buddha visited Tavatimsa Heaven to tell his Mother (then reborn as a God) of his Enlightenment. His ascent and descent was via the tripartite, jeweled staircase. The Hsinbyume has the elided form of both stupa and temple. Its plan is entirely circular including two sets of graduated terraces. The lower terraces have undulating exterior walls representing the oceans surrounding Mt. Meru while the seven upper terraces represent the seven lesser mountain ranges below Mount Meru. The small vaulted chamber at the crest can be entered and vacated by a tripartite staircase that descends towards the East. 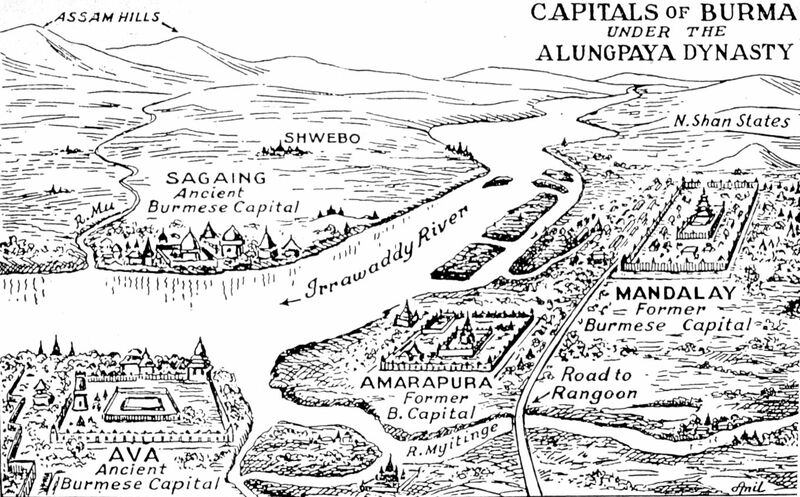 In 1784, King Bawdawpaya made a successful conquest of the kingdom of Arakan, which was located along the coast between central Burma and Bengal. Unlike his predecessors, he successfully obtained what is reputed to be the oldest and is certainly the most sacred image in Burma, the Mahamuni. He transported the image to the Mandalay area and had it installed in a temple slightly north of the city of Amarapura. This seated image is more than twelve feet in height and has been covered by the faithful with so many sheets of gold leaf that the body of the image is now completely obscured. Since the style of the face is not early, the image is believed to be a pastiche of several images particularly because the chronicles state that on earlier occasions when efforts were made to obtain the image, it was broken is several pieces. Badawpaya also obtained five Hindu images from Arakan that once stood in the Temple of Angkor Wat in Cambodia. These were placed in a shrine in the compound where they may be seen today. One of the few buildings that still stand within Ava’s city walls, is the Maha Aungmye Bonzan monastery built in 1818. It constitutes a new monastery type in that it is a brick and stucco replica of a wooden monastery. It was erected by the Chief Queen of King Bagyidaw (1819-1838) and has the massive staircases at its entrances that are typical of 19th century monasteries.